Is There a Retire Early Personality Type? This article was first posted on May 1, 2000. Back in March someone on the Retire Early message board asked if there was a "retire early" personality type. Your author mentioned that he had taken the Myers-Briggs Type Indicator (MBTI) years ago and was identified as an INTJ personality type. Since then, he's found several other INTJs who've happily retired early. The Myers-Briggs Type Indicator (MBTI) is a psychological test often used by management consultants in 'team building' exercises. It's been in use since the 1940's and millions of people worldwide have taken the test. Some 3 million people will take the test this year in the United States. The MBTI segments the human population into 16 personality "types". Click here for a description of each. We decided to do a survey of the Retire Early message board participants to determine MBTI type, and whether or not they were retired. The survey questions, as they appeared on the Motley Fool Retire Early Home Page board, message #6412, are in the box below. Go to the following web site and answer the four questions. You'll get a four-letter "type." Mine was "INTJ". A) I retired early and like it. B) I retired early, didn't like it, and went back to work. D) I'm not retired, and want to keep working as long as I can. A) 32 respondents were retired and liked it. B) Not surprisingly, none of the respondents retired, didn't like it, and returned to work. C) 98 respondents were not yet retired but sure they would like it when they do retire. D) 4 respondents were not yet retired and wanted to keep working. The table below gives a breakdown of the percentages of each of the 16 types in the population at large. The "IN--" types represent only about 4% of the population at large. The most common types are "ES--", representing about 52% of the population at large. Since the "Retire Early" group comes from a subset of the "world population" we can call "Internet users", it would be more useful to draw comparisons with the personality types of Internet users. Two large studies of Internet users who completed personality tests on-line are referenced in Table One. Table One. The 16 "types" vs. percent of population. (2) Internet "Web Users" by MBTI "Type" data from http://metalab.unc.edu/jembin/mb-data.pl . (3) Internet "Web Users" by Keirsey "Type" data from http://keirsey.com/cgi-bin/keirsey/stats.cgi . Of the 134 responses received to date, four respondents indicated that they were not retired and planned to keep on working. The remaining 130 respondents were either retired and liked it (N=32), or trying to retire and were sure they'd enjoy it once they get there (N=98). Of these 130 responses that were favorable to early retirement, three personality types stood out; ISTJ - 37 responses, INTJ - 27 responses, and INTP - 20 responses. These three personality types make up about 8% of the population at large, but account for 65% of the respondents favorable to early retirement. There may be a trend here. See chart below. It appears that the average Internet user is more introverted than the population at large. (Note: Myers-Briggs defines "introvert" as "inner-directed" (i.e., one who "gets their energy from within") rather than from the stimulus of other people. In this context, "introvert" doesn't necessarily mean "shy and retiring.") While the world population is only 28% "I", the Internet users averaged about 48% "I". The Retire Early group was even more introverted, with 89% of the sample composed of "I" types. Table Two. Comparison of several large studies vs. "Retire Early" survey. Another concern was the fact that the Retire Early group may contain a lot of "dot-com rich" computer professionals, thus making it difficult to conclude that there is a discernable difference between programmers and the "early retired." A study of the personality types of computer science professionals revealed that ISTJ was the most common type. 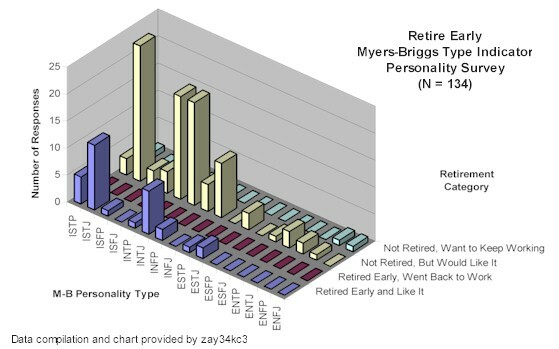 However, while the ISTJ personality type was the most frequent "computer" personality type, it appeared even more frequently in the Retire Early group. The INTJ and INTP personality types appeared no more frequently among computer professionals than the large reference groups of Internet users. Since ISTPs, INTJs, and INTPs appear much more frequently in the Retire Early sample than the Internet "Web users" or "computer science" samples, it's probably safe to conclude that these three "types" are more likely to enjoy early retirement. Which personality "types" make the most money? Not surprisingly, researchers have looked into this. One study of over 6,000 subjects taking The Personality Questionaire showed that ENTJs, ESTJs, and ESFJs were the top 3 in earnings. While these three "types" make up about 30% of the population as a whole, they composed only 6% of the "Retire Early" group. More support for the idea that you don't need the highest income in order to retire early. Another author has written a helpful book on the subject. I imagine the "dot-com" phenomenon has leveled the playing field for some of the more introverted types. Click here to order Why Should Extroverts Make All the Money? Today! Several respondents indicated they were also members of Mensa, the organization for "High IQ" individuals. One personality study of Mensans showed that nearly 40% of Mensans have an "IN--" personality type while only 5% of the population at large has the "IN--" type. In the Retire Early sample, "IN--" composed nearly 60% of the group favorable to early retirement. There appears to be some variations in the distributions of MBTI type among residents of different countries. Here's a comparison of Americans vs. Frenchmen. As one poster on the Motley Fool Retire Early board warned, the simplified Myers-Briggs Type Indicator (MBTI) offered by Hale-Online (see link: http://www.haleonline.com/psych/ ) is not as accurate an instrument administered by a psychologist. If you are using this test to adjust your medication, seek the assistance of a professional. [grin] As a rough test of the accuracy of the Hale On-line version of the MBTI test, we polled 25 Retire Early participants who had taken a professionally administered MBTI test and asked them to compare the results with their type as measured by the Hale Online version. Sixteen of the 25 respondents (65%) reported that the MBTI type reported by the Hale On-line version matched the results of a professionally administered MBTI test. It seems that for the majority of the sample, these free on-line MBTI tests give consistent results. There appears to be little harm in the average person using the simplfied test to gain some insight into themselves. While we used the Hale On-Line version of the test since it was easy to administer, there are other more robust versions of the test available free on-line. Readers interested in getting a second data point for their MBTI type should check out the Keirsey Temperament Sorter. This 70 question form is also available free online, click here. Another MBTI study I'd like to see is what personality types are "do-it-yourself" investors, and what personality types depend on brokers and financial consultants. As most "Fools" know, it makes a big difference as far as when you'll be able to retire. For those of you interested in ongoing MBTI research, the most accessible site I've found is Myers-Briggs ® Personality Type on the Web. The site is maintained by web designer Mary Hoerr and is updated weekly. Readers who didn't participate in the original survey are invited to take one of the online versions of the MBTI test, answer the two question survey that appeared at the beginning of this article, and e-mail the results to the Retire Early Home Page. (Send to intercst@earthlink.net) In about six months we will update the survey to include any new data gathered. For the October 2000 update on this study, click here. Copyright © 2000-2007 John P. Greaney, All rights reserved.